The 9 foot diamter tree that we removed from hole #7 had to be removed to the ground in preparation for the arrival of the stump grinder today. Our monster saw with a 48" blade went down so the guys had to use a different saw with only a 30" bar. Tough job but it had to be completed. Pictured below is assistant Mike and Russ chopping away. 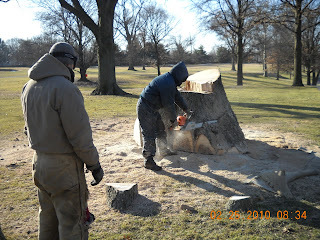 Mike had already completed a great deal of cutting around the base of the tree. Now it was time to work up a little higher. The stump grinder beginning the process of removing the stump. The aftermath of at least 2-3 hours of grinding. A majority of this material will be hauled away. If a large amount of dirt is mixed in with the ground material, it will be used to help fill in the hole. If there is too high a concentration of wood chips, dirt will have to be brought in so we will be able to grow grass over this spot. 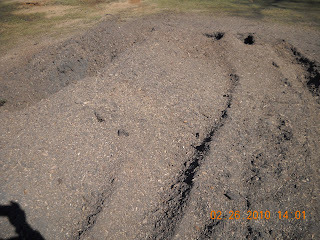 The wood chips can pull too much nutrition out of the soil robbing the turf of the energy it needs to grow. 10 of the larger stumps were ground today. This material will be removed early next week. Just completed our first batch of maple syrup. Little over1 gallon. Flavor is excellent. Produced with a little too much heat which created some crystallization when cooled but will be great none the less. Should get some great production this weekend from our taps. We will probably prepare another batch sometime next week. Chef Rob came down and helped me strain the batch. He's behind the camera. $ 296.13. Average over the last 4 years was $ 1363 with low of $ 927 last year to a high of $ 1686 in 2007. Total expense from 11-12-09 thru 2-16-10 $ 809. The soil surface of our zoysia fairways was frozen this morning when Assistant Mike started our dormant application of the non-selective herbicide Roundup and premergent herbicide Stonewall combination spray. 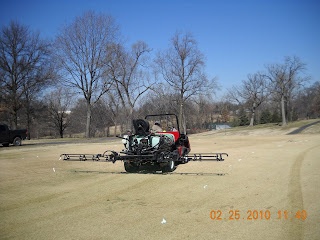 Since we are using a non-selective material Roundup, we have to spray it when the turf is dormant and not actively growing. The preemergent application in thrown in with the Roundup to reduce the number of applications we have to make during a season. The preemergent will lay on the surface of the turf until rain or snow will release it to the soil. The non-selective product is targeting poa annua which germinates in the fall and begins to grow rapidly as the days warm in March. I chose to apply this product at a lower rate but it can be effective on broadleaf weeds such as knotweed as well. 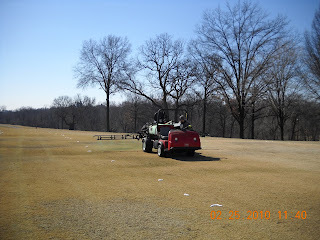 We attempt to make this application anytime in February on a sunny day when the turf is firm enough for the sprayer to drive on without damaging the fairways and when the temperature is near or above freezing. Poa annua can become actively growing very quickly with sunny days and temperatures above freezing. As it becomes active and starts to grow, the Roundup will do its work and kill the plant. The preemergent will create a barrier for crabgrass and goosegrass. Most home owners will apply this material toward the end of March through mid-April through a fertilizer spreader or sprayed by a lawn care company. We will begin applications on our rough in this time frame as well. We will also spray our zoysia tees and some of our green surrounds that are solid zoysia/bermuda. Our cool season green surrounds will be sprayed with just the preemergent only because the non-selective will selectively kill our fescue/bluegrass/poa surrounds if we had it mixed in the tank. A close up of poa annua that we are trying to control. There is some additional cool season grass mixed in with this stand. Assistant Mike on 18 fairway spraying. You can see the drops of foam that are appliced at the end of each side of the spray boom to help him with his next pass. A view from the back of the application being made. This application can only be made on dormant zoysia/bermuda. I try to keep this a strictly business blog about Glen Echo but I had to show this clip. I know we have a number of members who have served in our Armed Forces. I caught this clip regarding former golfer and now commentator David Feherty from CBS. A great tribute for those of you who have served or if you know someone that has served or is currently serving our country. David Feherty in Dallas Morning News. The philanthropic arm of the GCSAA(Golf Course Superintendent's Association of America), The Environmental Institute for Golf is leading a collaborative industry-wide effort toward a sustainable approach to golf facility management. "Sustainability is about ensuring profitable businesses while making decisions that are in the long-term interest of the environment and communities. The focus is on continual improvement by professionally managing and conserving resources and inputs, and reducing waste while providing playing conditions that satisfy golfers of today and tomorrow". Throughout the years, the industry has been trying to move toward a more sustainable style golf course. More facilities have been designed with a natural British Isles design,i.e. Bandon Dunes, Whistling Straits. Of course, climates along the coast of Oregon or Wisconsin are much different than attempting to grow grass in St. Louis. Audubon International out of the State of New York developed the Audubon Cooperative Sanctuary program for golf courses in which our club is a member. This program helps superintendents in identifying ways they could improve the environment of their golf course without negatively impacting playability. Turgrasses have been developed that resist disease, insects and can withstand higher and lower temperatures. Plant protectants have been invented that or more environmentally friendly. More slow release and or organic fertilizers are being utilized which have less impacts on drinking water. Equipment has been improved to reduce stress in turf by reducing the foot print weight of the machine and improving the actual cutting of the turf plant blade. Best Management practices have been developed by superintendents. Superintendents are better educated and more dedicated to keeping the environment in the forefront of our thinking when making decisions. At Glen Echo, our efforts in sustainability are in high gear at this time. We are provided with great resources by our membership but these resources are not infinite. It is very important that we develop and implement programs to improve our resource utilization and attempt to have less impacts on the living organism that we manage. An important resource that we manage is the water that we apply on the golf course. The system that was installed in 2007 is state of the art and is much more efficient in energy usage than what was in place for many years. Our water storage lakes are not large in size which requires us to purchase city water during the months of the summer. When our system is in full operation, we have about 2-3 days supply in our lake before it must be recharged by city water. Our city water is great for drinking but is not of good quality to apply to turfgrass. The water has a high Ph and bicarbonates which effect the chemical structure of our soil in which the turf grows. The soil acts as a storage bank and becomes out of balance with the city water and will not release the proper nutrients to the root systems of our turf. To offset the water quality, we must inject chemicals into our water which balances the water and helps the soil stay more balanced. It is important that we utilize our water wisely to reduce the amount of water that we purchase. Rain water or water that is held in our lakes has a tendency to be more in balance. All research points to a slightly firmer and drier golf course is healthier and more consistent. The largest resource that we manage is the labor on our golf course. Managing our staff can also help in the sustainability efforts. Increasing job responsibilities, proper scheduling, timely applications of PGR's(Plant growth regulators), fertilization, and other inputs to the turf can improve the health of our plants and reduce the frequency of other inputs such as mowing. The managment of green complexes including but not limited to aeration, topdressing, grooming, and rolling can lead to improved health, less inputs and better playability. Reduction in energy consumption including utilizing waste kitchen oil to power our diesel machines, wood to heat our maintenance building, more efficient light bulbs, and an overall reduction in gas/diesel consumption of 30% over the last couple of years has helped to streamline our department. As you can see, sustainability is alive and well at Glen Echo. I've attached below, a link to the Enviromental Institute for Golf's sustainability website. Environmental Institute for Golf's "Drive to Sustainability"
At the Golf Industry Show which I attended a couple of weeks ago, a new alliance was announced in support of the great game of golf. GCSAA(Golf Course Superintendents Association)PGA of America, CMAA(Club Managers Association) and NGCOA(National Golf Course Owners Association) have formed an organization called "WE ARE GOLF". This alliance has been formed to insure that the game of golf is represented at the legislative table in Washington, D.C. I've posted a video from the Golf Industry Show which explains the program and its purpose in a little more detail. I've also attached a link that can provide you additional details regarding this new organization that is being formed to assist our great industry. NEW to Glen Echo home page of Website "COURSE NOTES"
Course is open or closed for the day. Cart rules for the day. General information regarding some of the main cultural practices being performed on the course. We will post weather related information such as recent rainfall amounts. "COURSE NOTES" will be located on the lower right hand side of the public home page. It will also be available on the member side of the site on the home page in case you are making a tee time for the day. Place Glen Echo in the favorites section of your web browser so you are just one click away from knowing course information for the day before you arrive for your round. 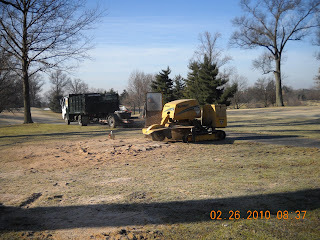 The maintenance staff will be updating the page on a daily basis before the 1st tee time. During the week of February 8th, I had the privilege of attending the Golf Course Superintendent Association of America's Education Conference(GCSAA) and Golf Industry Show in San Diego. The GCSAA has teamed with presenting partners which includes the Club Managers Association of America(CMAA) and National Golf Course Owners Association(NGCOA). Participating partners included the Golf Course Builders Association of America(GCBAA), American Society of Golf Course Architects( ASGCA), the National Golf Foundation(NGF) and the United States Golf Association(USGA). Education and the trade show are two key components of the event for me. 4730 seats were filled for 99 seminars which were presented at the conference by the GCSAA. I attended two seminars which had outstanding educators presenting some valuable information regarding the turf we manage at Glen Echo. The first was presented by Ronald Calhoun from Michigan State who discussed"Practical Use of PGR(plant growth regulators) for Golf Courses". We use plant growth regulators for a number of reasons here at our course. Reduction of poa annu seedheads on our greens in the spring. Applications to our greens during the season to reduce the amount of poa annua and increase the amount of bentgrass which is a stronger plant. Plant health, reduction in top growth encourages root growth and utilizes less energy which is important for the turf to survive severe environmental or stress conditions of the summer. Mr Calhoun discussed the different classes of regulators, how to use them effectively and presented research data to help evaluate the use of the various products. Dr. Frank Rossi from Cornell University presented "Beyond Organic-Sustainable Golf Turf". Dr. Rossi's take home point in his presentation revolved around improving resource efficiency. Improvement of resource efficiency not only makes sense for the health of our turfgrass but also makes good economical sense in utilizing the financial support provided by our membership. Early morning presentations called the Innovative Superintendent Session began at 7:00 a.m. on both Tuesday and Friday mornings. Presentations made by fellow superintendents provided great insight into various areas of golf course management including personnel, operations, and construction. Cultural practice tips in water management, bunker stabilization, equipment modification ideas, and quality control were some other great topics covered by my peers. Superintendents from Iowa gave us insight into the terrible tornado and flooding season that struck our neighbors to the north in 2008. Hard work, innovation and determination has brought the facilities back to pre-disaster conditioning. Two days of walking the trade show allowed me to network with vendors who provide products and services that support our facility. I was also able to check out new and or existing products that could help us provide better playing surfaces. The trade show also offers me the opportunity to renew relationships that I have developed over the years with local and national companies that provide valuable expertise and knowledge in helping our facility evaluate the many products and services that are offered to use on the golf course. It was a great five days of education and insight into the golf management industry. Below, I have attached a short highlight video from the GCSAA regarding the conference. Our collected maple sap is currently on the fire at the maintenance building. 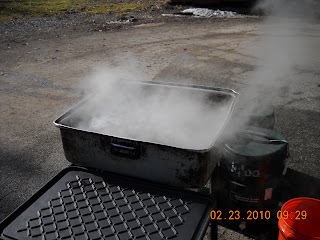 Beginning the boiling process to reduce the water out of the sap and make our Glen Echo natural Maple Syrup. Chef Rob is excited. He went out with me Saturday an drilled a few trees and put a couple of taps in place. He already has a couple of recipes in mind to utilize the syrup. We have collected about 60 gallons of sap so far so it will probably take a couple of day to process it down. Should make about 1 1/2 gallons of syrup. The below 32 degree nights over the next few days and above 32 degree days should provide for some pretty good sap flow and collection over the next few days. Pan boiling away the water out of our first batch of syrup. 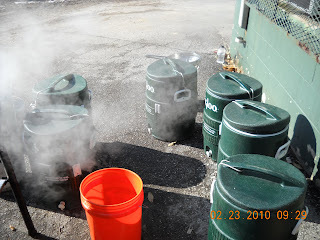 Our water coolers holding the 60 gallons of sap collected over the last 4-5 day. Over the next few days, we will be tapping a number of our Maple trees to accumulate some sap which will then be boiled down to provide Chef Rob with some Glen Echo natural Maple syrup. It takes 40 gallons of sap to make 1 gallon of syrup. 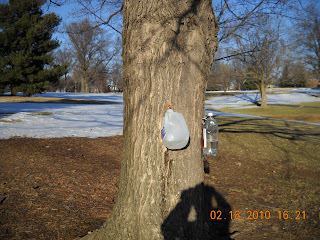 Trees will produce thousands of gallon of sap in a season and we will be collecting only about 6-10 gallons through the taps from each tree. We will be tapping Hard Maples and some Silver Maples which are in abundance on the course. I'm not sure how much syrup we will make here in our first season but hopefully it will be enough for you to enjoy in a dish that Rob prepares or over some waffles for breakfast this spring. My brother has provided me with some spouts he used a few years ago. 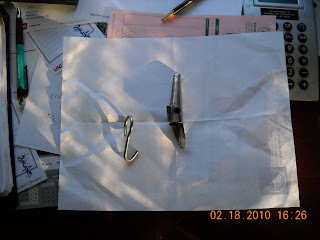 The picture below is a metal spout(spile) and the hook that holds the container which catches the sap as it drips from the spout. A hole is drilled into the tree and the spout is hammered into the tree about 1-2". 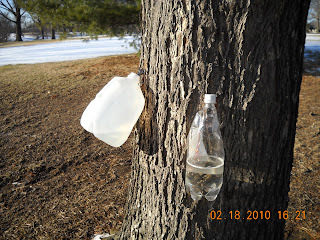 We will be using a combination of milk jugs, two liter bottles and some buckets to gather our sap. They recommend that the sap be collected regularly. We will be preparing the sap by the batch method which means we will boil it down 20-30 gallons of material at a time until it has reached its proper density. Hard Maple tree on #8 with a couple of bottles already collecting sap. Same tree from a different view. This tree is large enough and healthy enough two taps. 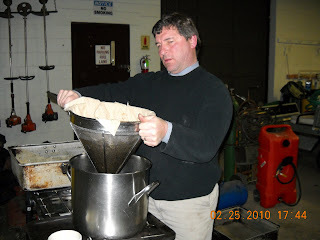 I've attached a link below for those of you who would like to read more about the production of maple syrup. The last snow fall is beginning to melt some with the nice sunshine we are having today. Overall, a fair amount still left out on the course. Looks like we are not going to be given any favors over the weekend with more snow predicted to be on its way. Another week without golf. Maybe we will have to plow the cart paths which will allow you the chance to get a nice walk in over the next week or two. We will be plowing the parking lots and entrance road this weekend if we get any accumulating snow so don't hesitate to come out for a nice dinner. I was in the pro shop yesterday where I saw that Nash and Kevin have the sign up sheets posted for the first few club events of the season. Hard to believe that St Pats is less than 30 days away. I'm sure our snow birds are wishing they were here! The staff had a cold, nasty and tough job to do this week. 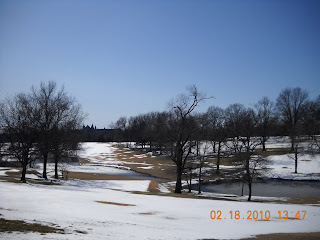 We noticed a large ice field over near the cart gate on the 18 rough side of the tennis courts a few weeks ago. 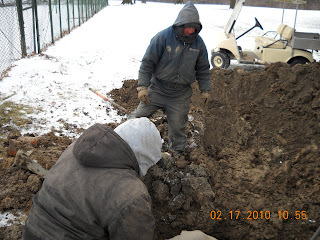 Initially, we thought it was water draining off of the tennis courts but in the end, figured out it was the old water line which feeds the pro shop/maintenance building that was leaking. The staff worked on the 1" line next to the pro shop last week which we found as well. The pipe leading from the shutoff toward the pro shop is a 3" line. Somewhere between the tennis courts and the pro shop the line reduces down to a 1" line. Initially, the guys dug by hand in an area about 3-4' from the hole below. 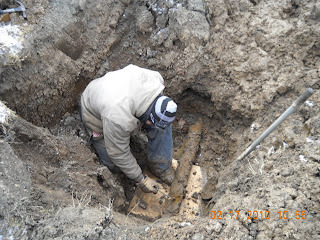 In probing through the soil profile, they found a pipe that they thought could be the problem but it appears to have been an old irrigation metal line. Turning the water back on gave them a better idea where the water was coming from and the digging began a couple of feet away from the original hole. Water came back on and they found the actual section that was leaking. They then brought the backhoe in to do the heavy digging which exposed the hole below. Assistant Mike in the hole cleaning off the deteriorated outer band of the pipe to find the actual section that was leaking. Skip as Russ checking out the situation. Another view down into the hole. The completed repair below. 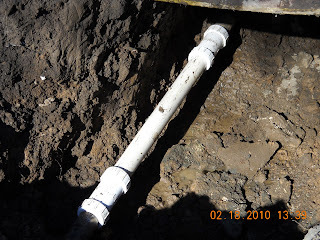 The leak was coming from where the pipe was threaded together. I've wondered why the water comes from so far away to feed the maintenance building and pro shop. I had forgotten that the original clubhouse was located where the tennis courts are today. This is the original water line that fed our club potable water back in the beginning. One of these days, this old line is probably going to have to be abandoned. It would make more sense to bring our water in from the clubhouse main which is a great deal closer than the existing feed area that we have right now but that will be for another time. The pro shop and golf maintenance department share a city water line that comes from Lucas & Hunt Road via the Halfway house. A long way to bring water but that is the way the system is set up. Each winter, the old line will spring a leak or two. Skip and Russ got the honors in repairing the first leak just below the pro shop this past week. 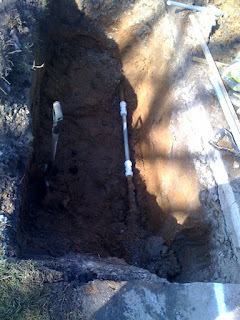 The repair required us to cut through part of the asphalt/concrete to get to the pipe. The repair required a couple of threaded couplers and a piece of pvc pipe. The failures in the line seem to occur from the shutoff next to the 17 green side of the tennis courts to the two buildings. You might remember the repair behind 18 green late last winter. There will probably be a time in the future when the line will need to be replaced. A second leak has sprung up between the tennis courts and the first line of trees along #18 which they started to dig up late last week. We plan to complete the second repair in the next day or two. 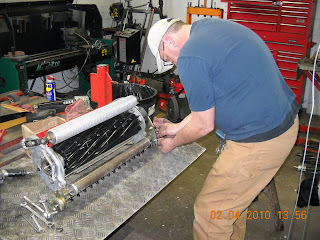 Our mechanic, Harry White working on one of our riding greens mower units. Harry is rebuilding one of the three reels for the unit. These units are used in the early and late season and during our sanding operations during the season. The reel is sharpened on a regular basis which wears down the reel to the point where it will not make contact with the grass. He will rebuild one unit now and have it ready for the beginning of the season. Harry plans to rebuild the second unit after our deep core aeration is completed in March. The mowing operation after aeration will trash the 2nd set of old reels which will then be replaced. Harry does a fine job in maintaining our equipment and also operates equipment during some of the busier times of the year like aerating greens, fairways and during the extra mowing required during "The Invitational". Harry putting reel back together. 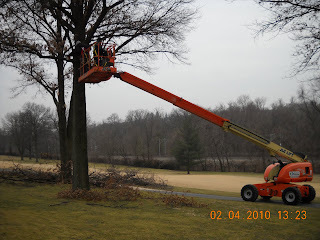 Our TMP,(Tree Maintenance Program) not only includes the removal of dead and or damaged trees but also requires that trees be pruned to remove lower branches. The removal of the branches is needed for a number of reasons. As a tree becomes mature, shade from the upper branches reduces the ability of the lower branches to survive because the lack of sunlight. Lower limbs are removed to improve the overall health of our turf in the rough under and adjacent to the trees as well as along the fairways by allowing more sunlight to reach the grass. Smaller trees have limbs raised to allow carts and mowing equipment to navigate around safely. 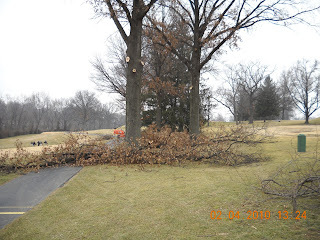 Dead limbs are removed to reduce the opportunity for disease and insect damage. Assistant Skip and Russell doing the honors along # 2 cart path. Limbs which have been removed and are then cut up and hauled back to our chipper in the maintenance area. Tom and Jason have been working the last few days doing the clean up work. We've got one more week rental of our lift so the guys will be working feverishly over the next 6 days to complete as much work as possible. Over the past couple of seasons, poa annua, bentgrass, and other cool season grasses have been popping up along perimeter of our bentgrass/poa annua approaches and are attempting to choke out the zoysia. Poa annua has loved the last two seasons of record rainfall and somewhat cooler temperatures. We apply preemergents in the late summer to reduce the level of infestation. 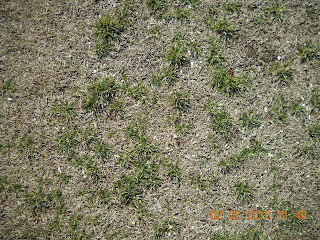 Usually, the zoysia will out grow the poa annua and the heat of summer will help to eliminate the rest of the material. We just recently applied a very light application of Roundup on these areas. 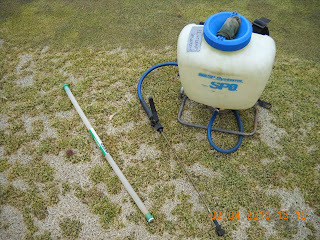 The picture below shows the backpack sprayer with a flat fan nozzle and a Weed Pro sponge applicator. Weed Pro sponge applicator on the left and backpack sprayer on the right. 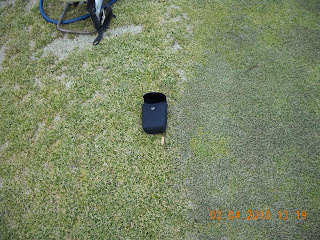 The picture below is on the front of #16 green between the bentgrass/poa annua approach on the right side of the camera case and to the left is the zoysia approach with the cool season grass contamination. Over the next few weeks, the cool season grass along the collars should begin to turn yellow and will then die. We will probably have to do some additional spot applications where some poa annua might have been missed in the initial spraying. A majority of the zoysia grass should come back but we might have a couple of the more heavily infested spots which might have to be replaced with some new zoysia sod. We will evaluate each approach once they come out of dormancy in April for potential replacement.